How Do Your Stackers Stack Up? If you are looking for a lift equipment solution for your Maryland business that is practical, low-maintenance, and affordable, then stackers are your best bet! While heavy-duty forklifts and other types of equipment can end up costing you, both in the initial investment and in general upkeep, stackers are different. So what exactly sets stackers apart and which kind of stacker will best suit your needs? Read on to find out more! 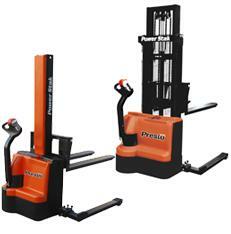 Stackers are the perfect match for a business that needs a lot of light-weight moving done. While bulky forklifts may be right for dealing with oversized shipments and items, the reality is that stackers can be a very good, lower-cost alternative to forklifts, while still accomplishing your workload in an efficient manner. Stackers make a much more practical choice, as they are more commonly needed on a day-to-day basis in any warehouse or work area. Not only are stackers an essential piece of equipment, but their size compared to a heavier piece of lifting equipment means that they will not become obstructive in your warehouse. What Kinds of Stackers are Available to Me? There are a wide variety of stackers available that can each suit a particular need. Manual stackers, for instance, are simple both to maintain and operate, and can handle the majority of your light to medium-capacity needs. Powered stackers have even more potential applications, with the ability to rise to a height of 150 inches or more. For heavier loads, electric stackers are a good choice, and for lifting pallets both straddle stackers and lift pallet stackers will do the trick. And that’s not all- battery-powered, counterweight, and drum stackers all also suit your unique purposes and provide you with the functionality you need in order to keep everything in your business operating smoothly. You can count on S.W. Betz to help you stock up on all the stackers you need; we provide stackers from top brands, including Presto Lifts and Vestil. Get in touch today for more information. This entry was posted on Thursday, November 20th, 2014 at 6:45 pm. Both comments and pings are currently closed.